Olmos, J.; Gelonch, A.J. 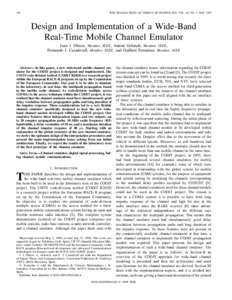 ; Casadevall, F.; Femenias, G.
Olmos, J., Gelonch, A.J., Casadevall, F., Femenias, G. Design and implementation of a wide-band real-time mobile channel emulator. "IEEE transactions on vehicular technology", Maig 1999, vol. 48, núm. 3, p. 746-764.